You are currently browsing the category archive for the ‘Journaling’ category. 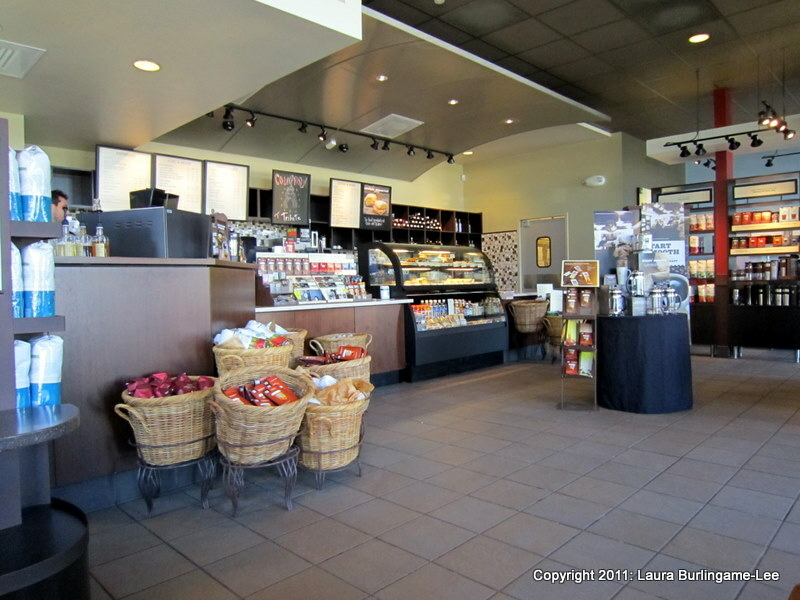 One of my local Starbuck's...great place to think and write! What book, song, or movie best describes your life? What makes you feel insecure, and what makes you feel secure? What is the most important thing in your life, and why? -“If you could write a story with yourself as the hero, what would the story be about?” Write that story. -What mythological stories seem to speak to you? Write a myth incorporating the pieces that speak for you, and make yourself the hero/main character. What happens? -“If there was one thing in the world that symbolized “you” – who you are, what you want to be, where you’ve come from, etc – what would that symbol be? Draw it. -Create pictures of the positive and negative sides of yourself. If these were masks, what would they look like? Make the mask, if you feel like it. -Write a poem about your pain – loneliness, sadness, trauma – use the poem to transform the pain and yourself. -Write yourself (or someone else) a note using only cut out letters from magazines and/or papers. -Get a template or draw a blank jigsaw puzzle – make a puzzle of you – what are the pieces that make up who you are? -Use the puzzle template to create poetry – photocopy several of them and print words in each piece. Put the puzzle together different ways for a found poem. -What don’t you give yourself permission to write about? Why? What would it take for you to be able to write about it? Write about it! -What kind of privacy do you need to write? Is your journal a public work of art? (Some are, some aren’t). How can you/do you keep your private stuff private? -Write some of the stories of your family and childhood in the third person – as stories. Do you feel any different about them after writing them this way? -What are you supposed to be like? -What would your family or friends think if they knew you _______? -If your life were a fairy tale, what would happen? -What is sacred to you? -How do you let go of control and let in faith/grace/your Higher Power? -What do your inner and outer selves look like at this time? How are they different? -Draw how you see yourself. -What do you believe about yourself, about the world, about the people around me? -What are your beliefs about life in general? -If some of these are negative, what would it take to change them to a positive view? -How do you nurture, care for, and/or soother yourself? What keeps you from being able to do that? What would help change it, so that you could take better care of yourself? -Draw one of your dreams – what symbols seem to come out at you? Draw those and journal about what they mean to you. These are great ideas – if you have others to share or other resources to share, I’d love to see what you’ve got as well. There are also some great websites out there with journaling prompts – you can google “journaling prompts” to get some of them. This is cross-posted from my professional blog, The Other Side of the Couch. I’m interested in what you all have to say, too! I’m thinking of planning a retreat. I know, I’m probably nuts, but I figure if I need it, a lot of other people do as well. With my values being what they are, I’d love to make it free of cost, but reality dictates that I probably should charge to cover rental space, materials, food, speaker/teacher fees, etc. So, I have some questions for you all: If I were going to do this, what are the kinds of things you’d like to see? I have some ideas, too – I’d like to blend creative expression in some form with self-esteem, empowerment, relaxation, and healthy interactions. I’m envisioning a day to start with people being able to choose/sign up for 4-5 one hour “experiences”. I would probably do a group breakfast, all together with fruit, pastries, tea/coffee, juice, along with a keynote/introductory address. Then, have people split up to do their “classes” with a 1/2 hour break in between for mingling and sharing experiences, and then wrap up with a brief talk about taking it home and living it in your life. 6) Writing Your Own Path – identifying archetypes that speak to you, and writing your own myth with you as the hero/ine. Wrap-Up, Thank-you’s to speakers/presenters, Evaluations and Suggestions. I also envision having some vendors there making available relevant and inspiring products – humorous items, journals, inspirational works of art, gift baskets…I’d love to be able to offer a gift basket as a door prize/raffle/auction item. Another idea would be to have participants bring in creative pieces for a silent auction to benefit a local cause. What else can you all think of? that make you a better YOU. What have I done for myself today? Did I put something new in my life? What kind of feedback did I receive today, and how did I feel about it? What were my goals for today, and how successful was I in reaching them? What am I doing to help myself today? How am I disciplining myself to do something I didn’t want to do, but needed to do anyway? What do I feel my strongest asset is today? What am I changing about my life? What am I willing, or not willing to change about my life? In what ways could I make my life work better for me? If I feel blocked, what feelings or events am I using to keep myself stuck? Write a letter to someone with whom you are feeling some unfinished feelings. an excuse to bash yourself; make it work FOR you. What circumstances occurred today which helped me understand myself? How will I use what I learned? What happened around me today? What happened in the world today? The country? Our state? Our town? Our campus? What happened with the people I care about? What are the the events that affected me, and how did they affect me? changed and added some questions to apply to a college background. 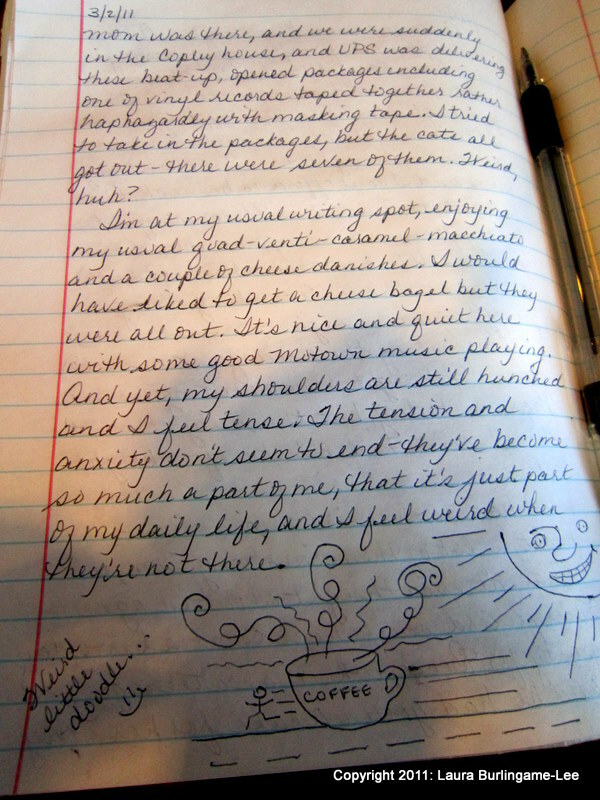 Chapman, Joyce, M.A., Journaling for Joy, Newcastle Publishing Co., North Hollywood, Ca, 1991. Sark, A Creative Companion: How to Free Your Creative Spirit, Celestial Arts, Berkelely, CA, 1991. Sark, Inspiration Sandwich: Stories to Inspire, Celestial Arts, Berkeley, CA, 1992. Sark, Sark’s Journal and Playbook, Celestial Arts, Berkeley, CA, 1993.